Improving your personal development skills should be a never-ending pursuit. As good as you are today, you can always prepare yourself to become better, producing more, consuming less, etc. In this chapter of our Executive and Life Coaching training course, we focus on the importance of paying close attention to the little things. As the old saying goes, "Success is in the details." It was a little thing for a janitor to leave a lamp swinging in the cathedral at Pisa, but in that steady swaying motion the boy named Galileo saw the pendulum, and conceived the idea of measuring time. It was a little thing for a cow to kick over a lantern, but that one small act laid Chicago in ashes and thus rendered homeless over one hundred thousand people. Leaders understand that the little things matter, and they apply this thinking when seeking to improve their personal development skills. For instance, the smallest remark made out of haste or frustration can convince a friend to turn a cold shoulder to you forever. Yes, little things can make a major impact to your life and career. A tiny weakness, the smallest self-indulgence, a quick temper – these are all little things that can wreck the most promising career so it is imperative that your personal development skills are finely tuned and well disciplined. The children of a spectacle-maker were playing and placed two or more pairs of the spectacles before each other, then told their father that this made the objects look larger. From this small hint came the telescope. In nature there is nothing small. All of life comes from microscopic things. The microscope reveals a world every bit as great as the world revealed high above from the telescope. "The history of many lost opportunities can be written in three words, 'lack of detail'. No matter how strong or large all the other links of a chain may be, the ultimate strength of the chain lies in its weakest link. It is our greatest weakness which measures our real strength. To dress well can make the difference in getting a new position; to speak well can be the reason for a promotion; and to keep time well can be the reason for all sorts of good things to come. These are all great examples of personal development skills that cannot be ignored by a serious leader. The power of observation in the American Indian has put many an educated man to shame. While returning home, an Indian discovered that his venison, which had been hanging up to dry, had been stolen. After careful observation he started to track the thief through the woods. Meeting a man on the route, he asked him if he had seen a little, old, white man, with a short gun, and with a small bob-tailed dog. The man told the Indian he had just met such a man, but was surprised to find that he had not even seen the one he had described, and asked how he could give such a detailed description of the man he had never seen. "The act taken in a single moment may cause a life’s regret or victory." The message of this story is to always pay close to attention to the smallest of details. One small step taken can make a career and one small mis-step can cause great damage to your reputation. As you seek to improve your personal development skills, keep working toward big goals, but never forget that it's the little things that make big things possible. "The creation of a thousand forest is in one single acorn." Describe a small act that you’ve made in your life that ended up making a bigger impression than you thought it would, for better or worse? Explain in detail the series of events that occurred as a direct result of this one small act. Like one small pebble in a pool of water, describe the various ripples that resulted. Understanding the importance of paying attention to the details of a current project you are working on (personal or professional), what steps can you take to increase your chances for success. How can those small details ensure that the project is viewed as a huge success? 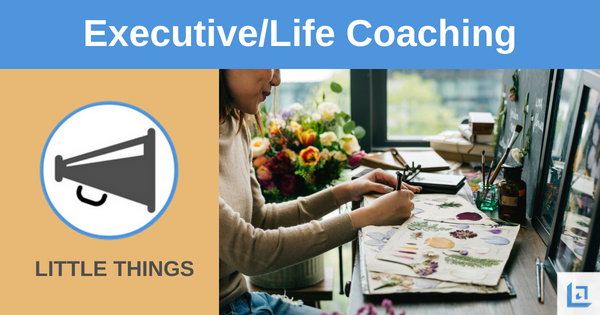 To download our free Executive and Life Coaching training book, providing personal development skills advice, lessons and exercises, simply subscribe to our free newsletter. You will immediately receive a password that grants access to our entire leadership tools library.